Fun Fact: I used to have a food allergy to white potatoes, but not sweet potatoes. 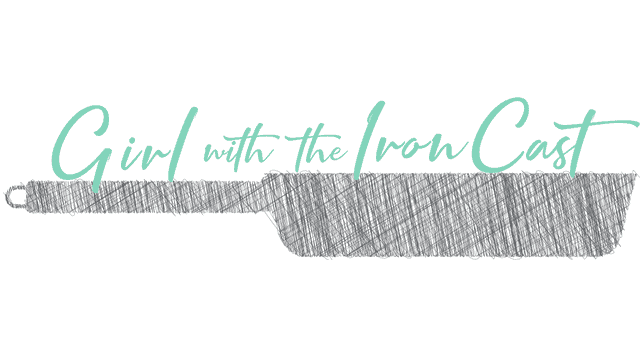 Weird…I know, but it actually kinda forced me to like sweet potatoes. Although I can eat white potatoes in moderation now, I still find myself going back to sweet potatoes. 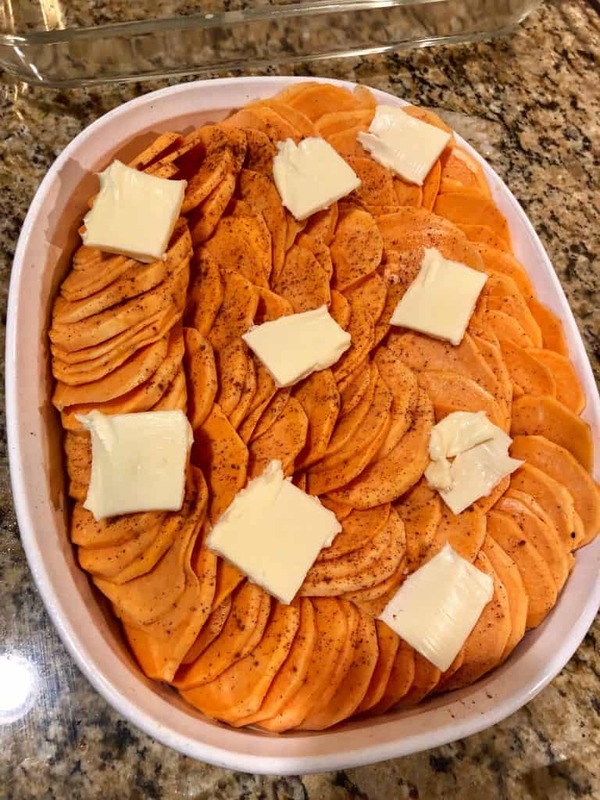 I made this sweet potato gratin for our Thanksgiving this year. 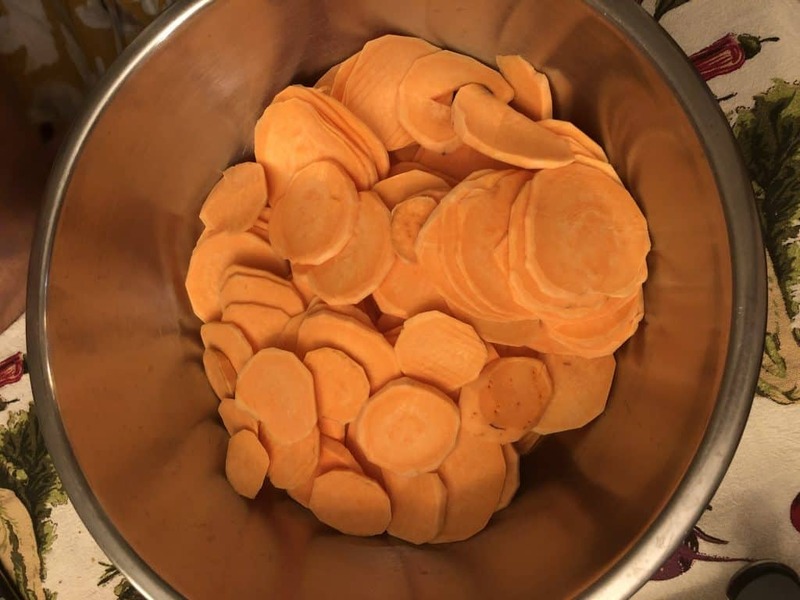 I peeled the potatoes, then using a mandoline, thinly sliced the sweet potatoes (please don’t chop your fingers off, use the guard). 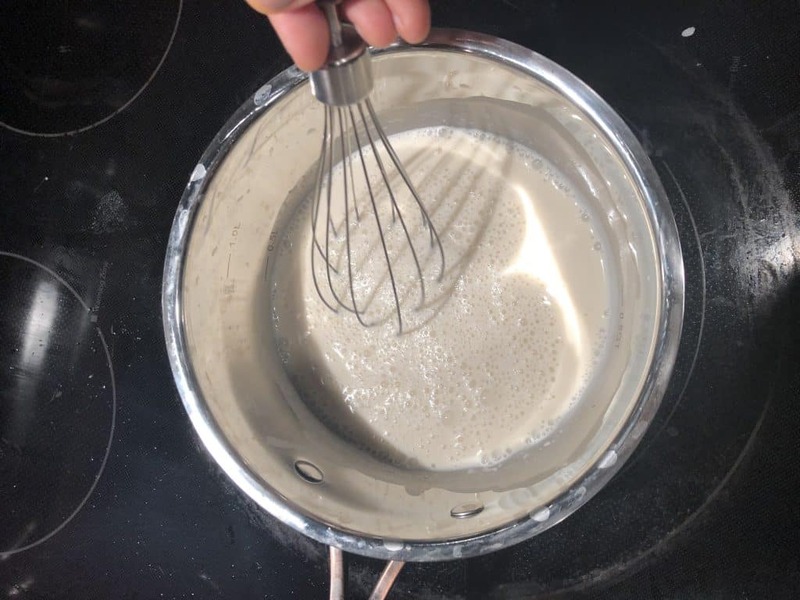 On the stovetop, I warmed up some whole milk or heavy cream, brown sugar, cinnamon, and nutmeg, until the brown sugar dissolved. Add the spiced milk mixture to the sweet potatoes and mix. Allow them to soak for 20 min. 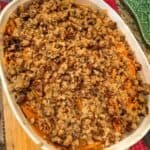 Arrange your sweet potatoes in a baking dish. I tried to make it in a perfect circle and make them kinda stand up, but that failed lol. So just try and stuff them in there in some orderly fashion. I added some butter on top and extra cinnamon because we aren’t holding back on the decadence here people. Cover with foil and bake for an hour. While baking, you’re going to make my favorite part the pecan streusel topping! In a large mixing bowl you’re going to mix together flour, brown sugar, granulated sugar, cinnamon, chopped pecans, and butter. Youre going to form a crumbly mixture that you’ll sprinkle on top. Pop it back in the oven for 25 minutes uncovered and there ya have it! Peel potatoes, then uniformly slice using a mandoline or knife. Place in a large bowl. In a small saucepan, over low/medium heat, add the milk or cream, brown sugar, 1 tsp cinnamon, and 1/2 tsp nutmeg. Stir until sugar has dissolved, about 3-5 minutes. 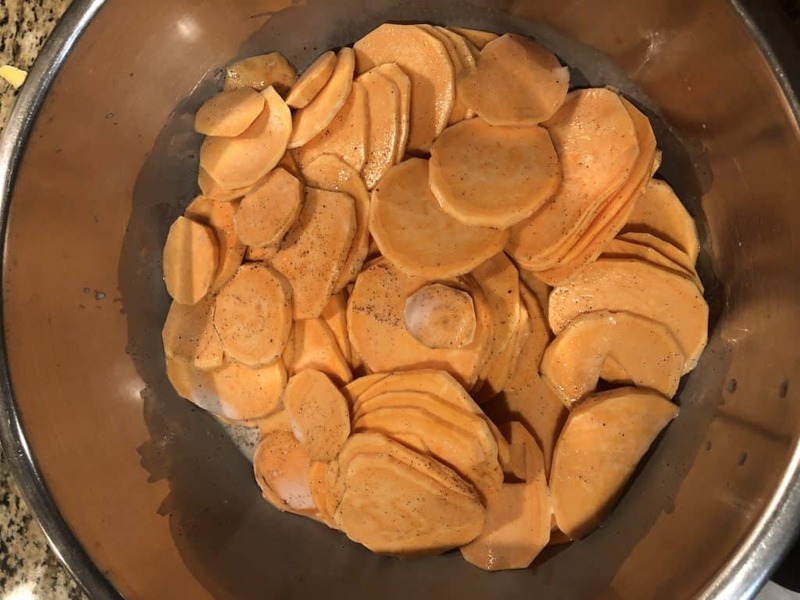 Remove from heat and pour over the sweet potatoes in large bowl. Mix to coat all the sweet potatoes and allow to sit for 20 minutes to absorb. 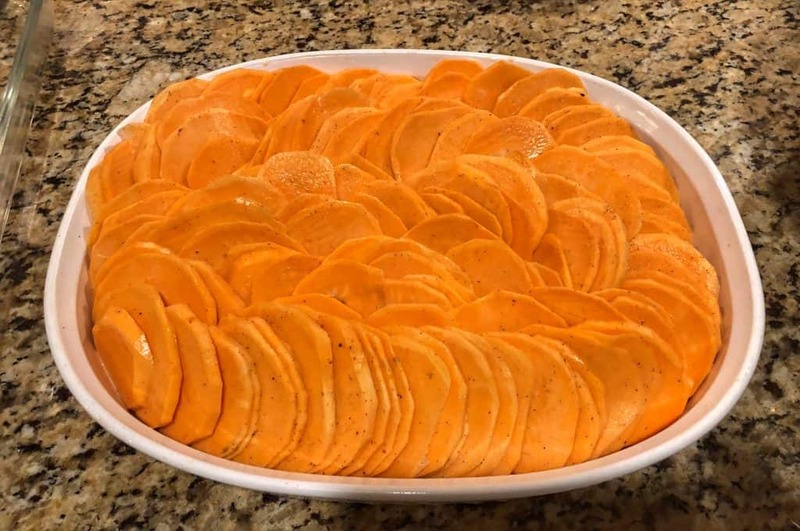 In a casserole dish, spray non-stick cooking spray and arrange the sweet potatoes so they are fanned out almost vertically, throughout the dish. Discard the dairy mixture. Sprinkle the 1/2 tsp of cinnamon over the slices, scatter slices of butter on top, cover with foil and bake for 1 hour. 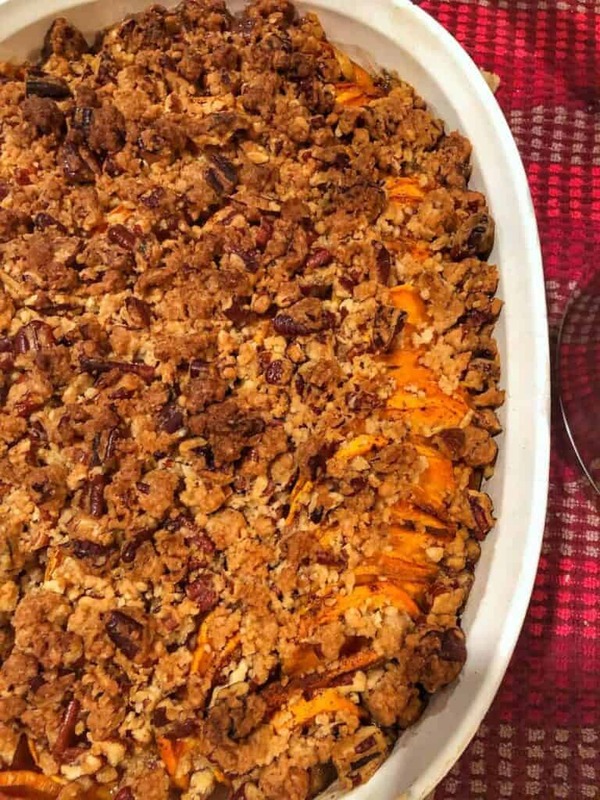 While the sweet potatoes bake, in a large bowl combine all the topping ingredients until it has a crumbly texture (I typically use my hands to mix it and achieve the crumbly texture). 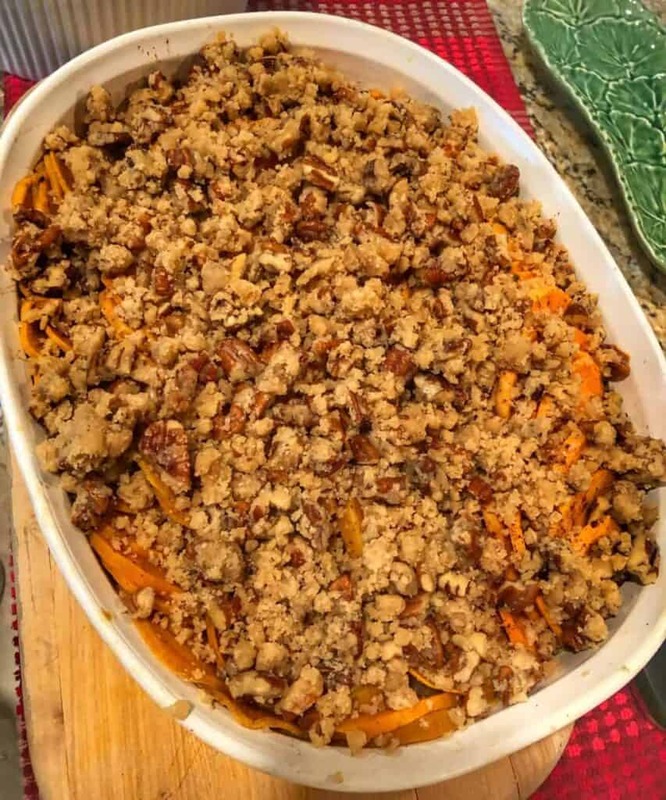 Once the sweet potatoes are done cooking, remove from the oven, uncover, and sprinkle the brown sugar pecan mixture on top. Put back in the oven for 25 more minutes or until the topping begins to brown. Remove from oven and serve.